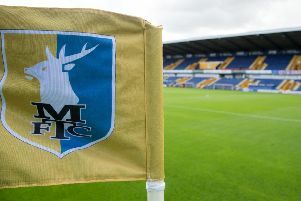 Mansfield Town manager Adam Murray has ordered his side to come out of the traps flying against Crawley Town on Saturday. After three 1-1 draws, Stags are still seeking their maiden home win and for the second League game in a row had to achieve points the hard way by coming from behind in last week’s 1-1 home draw with AFC Wimbledon. “One thing I didn’t think we did on Saturday, which we have done in most our games, is set the tempo,” he said. He added: “We know them (Crawley) inside out already and we are working on them this week. The lads are working really hard. Our focus is on Crawley and we really want that first home win. “We want to put the points on the board now as we feel we can really start grabbing this league by the so-and-so’s now – and that’s what we are going to aim to do. “They are very efficient. They’ve only got a very small squad. I know Yatesy (manager Mark Yates) really well. I played with him (at Kidderminster). I did his running for a fair while, so I know he knows the league inside out and he will have them organised and they are very structured.